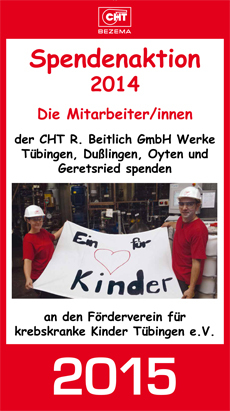 22.01.2015: Striving for a joint social commitment in the future, the staff of CHT R. Beitlich GmbH proved to be very creative and generous. For the project initiators Ms Jennifer Petrzak and Mr Roberto D’Ulisse it was a sincere wish to invite all departments of the German sites to a photo shoot. Assisted by various colleagues and external partners they used these pictures as a base for designing a family calendar which was then sold within the company. In addition to selling 750 calendars, staff members had made donations throughout the past months. In the end, the donation amounted to 19,002.30 Euro after the Reinhold Beitlich Familienstiftung (family foundation) had doubled the donated sum. The Förderverein für krebskranke Kinder Tübingen e. V. (Association for children suffering from cancer in Tübingen) were delighted to receive the cheque from the initiators Jennifer Petrzak and Roberto D’Ulisse as well as from the Head of Human Resources, Mr Peter Hepper. The donated sum shall be used for various projects at the association's parents' house where the families of children suffering from cancer are offered accommodation, assistance and social activities during the lengthy therapies. The CHT staff are already planning another social campaign for 2015.